…a place of unlimited darkness. “Be careful where you step!” said a cold voice. “This spot is taken.” Dozens of eyes blinked at us in the Stygian gloom. By the time my uncertain visitors turned to ask me what to do I was already far away. Even my bellowing laughter couldn’t fill this space. This is the door the Minotaur takes to leave room 24. It leads back to room 0, the prologue. It is “far away”, as the text states, and 0 is nothing, so there still “are no doors”. This door can only be taken by the Minotaur and not by the guests, who are stuck here forever. Even my bellowing laughter couldn’t fill this space. The Maze. This suggests, as is in fact the case, that the whole House is a trap. The eyes are all 0s. Page 1 being room 1 page 0 would be the prologue. Room 24 leads right back to the Prologue, which starts outside the Maze: this room isn’t a trap but your only means of escape! WELL probably a tongue-in-cheek suggestion but, among other problems, if this were permitted then one could get to the center and back in fewer than 16 steps. It depends what the prologue counts as. If going back to the prologue is a logical step to be made, then yes, there could be a faster route. (Although you would have to count prologue-1 as a step both times.) If it counts as a “restart” clearing all your previous progress, then no, there couldn’t be. It’s all semantics, I suppose. As for the fact that nobody would be in the room, not everybody would be clever (or possibly deluded) enough to find a way out. Or possibly, only the Minotaur can take this route to greet a new group of guests. “This pit is as black from pole to pole.” – “Invictus” by William Ernest Henley – Birds robed in black do not give up their secrets easily. They love to watch us marvel over their messages. Black birds demand our commitment to learning their wisdom, and do not reveal their meanings unless they are convinced we’ve devoted ourselves completely to the path of understanding (both dark and light sides of) energy. This concept correlates to lunar themes too. The symbolic meaning of blackbirds is eternally linked to the “dark vs light” phases of the moon. I’m talking nocturnal awareness. Illumined lunar understanding which requires a different use of the senses. Sense which can only be utilized when transformative devotion is made. A commitment to higher knowing (flight) and an acceptance of the void (infinite vastness that eludes the ego and rational mind). This is because birds are (metaphorically and mythologically speaking), situated in proximity to the higher energies of the Universe. This also positions them as heavenly or divine oracles and messengers in cultural myths across the globe. Through consistent unveiling of your Inner “Depths”, (as our coal-black avian friends would have us do) positive/active utilization of these Inner impulses the esoteric secrets become exposed to the light of your own consciousness. He doesn’t. The crowd enter before he does, and he simply turns and silently departs. There is nothing in the conversation which states that he actually enters. Thoughts on this please? Have I got it wrong? If the guests enter Room 24 directly from the Path or Loop rooms, then guide can simply go back that way. If they got there from the trap rooms, then he can go back and climb up the slide to Room 41 and get there. Or unlock one of the locked doiors in The Cage. If they went in through the mouse hole in room 14, I can imagine the guide giggling about how they’re trapped like mice. If you believe that the eyes in here are only the eyes of your group, the number of pairs of eyes drawn could indicate the number of people in the group. That said, I always imagined the group to be something like 5-10 guests and a bit smaller than the 19 pairs I count here, and I always thought the eyes included those of previous groups. The narration text seems to agree with me that there are far more eyes visible to the travelers than their own group. I wonder whether those in the Abyss die of thirst, or whether they live in darkness forever? Whether they die for their thirst of knowledge, perhaps? 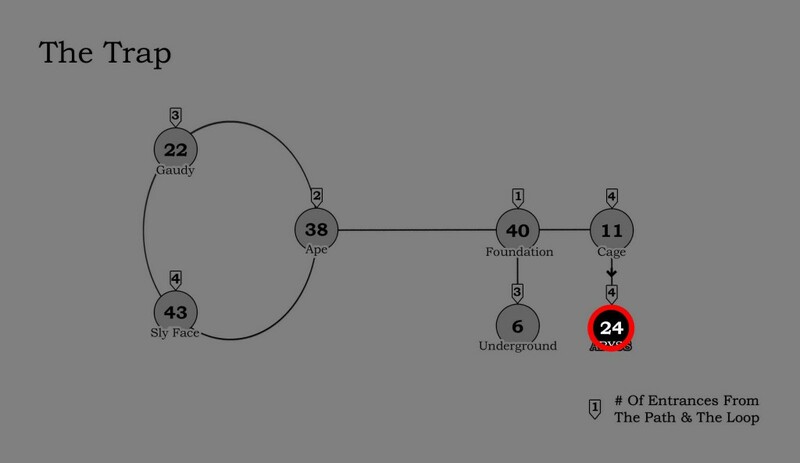 The map indicates 4 entrances to 24 from the Path and Loop, but there are 4 entrances total, including Room 11. Oops! One more proofreader point for you! I’m assuming this room is solved? The general consensus is that there is nothing here to solve. Feel free to prove us wrong. Just food for thought about descriptions in the narrative, what is “Stygian gloom”? This is mentioned when we are told that dozens of eyes blinked at the guests “through the Stygian gloom.” Any thoughts? Also, now for speculation…could the creatures in the Stygian gloom be previous guests who also made the mistake of wandering into room 24? Also gives us an guide identity clue, simply that the guide is pretty mean. After all, he laughed when the guests failed and were trapped. Any ideas on “Stygian” or what the creatures are? Am I missing a reference with Stygian? It’s a reference to the river Styx in ancient Greek mythology. Basically Room 24 is akin the underworld, the place of death, in Greek mythology. The visitors can’t get out of the trap but I don’t think Manson actually says the Guide can’t get out but then the Guide should know better than to go in to begin with. Some ideas for this room 1: Holding the picture upside down, the eyes look better to me…that could mean we have little bats hanging out here. In keeping with my monster theory this could mean Count Dracula (you can count on me) has led his “children of the night” as he calls his bitten kept prey. “BELlowing LAughter clues BELA LAGOSI. Some ideas for this room 2: “Four and Twenty blackbirds baked in a pie”, nursery rhyme…no doors in a pie. 20 sets of eyes and four visitors about to join in. Interesting. We recently said that 4 seems the best number for the number of visitors although other numbers are possible. And there are 20 sets of eyes here. That does give you 4 and 20 that matches the room number, and the song, and the song matches the identity of the guide. The rest of the song seems unmeaningful, however. “baked in a pie” could mean trapped I suppose. But simple songs like this are used elsewhere – like in room 9, so that is a plus. It does not really help us in anyway, other than maybe some slight help on the identity of the guide. But then there is no other help to be gotten here since there is no way out of the Trap. Actually – song or no song – it might count as good evidence that the number of visitors is 4, just because it would make 24 sets of eyes in room 24. Does the guide actually enter this chilly room? Or does he keep out and basically tells all of us that he will enter when hell freezes over? Reposting here in room 24 rather than general comments. White Ravens sample of this page has 24 eyes to represent room 24 I imagine. The book has 40 eyes, I think to suggest the correct path back in room 11. Also the text has the word “dozens” which is non-random looking. 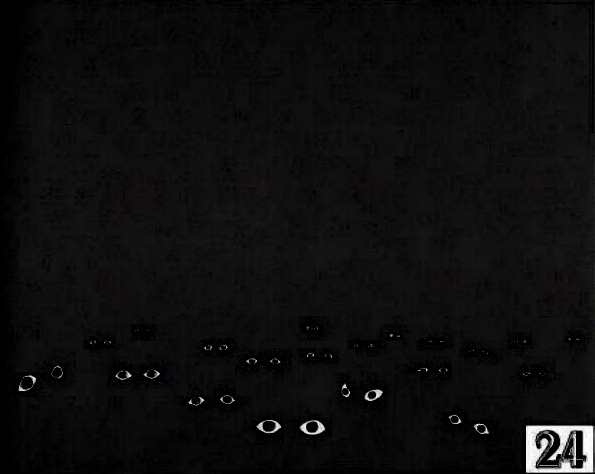 There are 3 dozen eyes pictured, with a remainder of 4. 3,4 = room 34. The eyes are clues for eyes! We could not possible know that without a clue to room 34! To me the eyes are part of a (here ironic) theme that tell us we need to look Raven in the eye to escape the Trap. And maybe “blinked” in the text helps us know that we can see the eyes. Maybe they are windows to the soul? How does the guide get away? Does he fly? And if this is the void of space should we think of “devil bird” like in room 26? Google tells me that song is about the dangers of fate. SP, somehow I can’t imagine the King of Pop bellowing with laughter. By the way, DG, don’t overlook the “Bell” in bellowing (i used to have a theory about that). And Greg is right, how does the guide get out? There must be a way out of room 24 and the Trap. Tell me more about bellowing theory. I see bell and wing. Both could be significant but I can’t mAke much of them there. Bellowing is not a common word, so probably not random. The Bell in Bellowing could be referring to the Bell in the devil/stage room or the bell in room 11. Also mentioned in one room (I forgot which) is that the guide heard a faint ringing behind a wall. Guide didn’t want the guests to hear (a clue!) and rushes the guests onward before they notice. THis is what I had in 2012. Anything else? What can we say about this room? Dead end? It is the only room which has a description ending it a period, for obvious reasons. BTW – “Stygian” means “of the river Styx”, and may mean this is supposed to be the ancient Greek underworld or land of the dead (or “hell” if you’ve skipped ahead to the final message in room 43). One more note is that to get the 190 doors counted in room 5, we have to count doors that terminate here, even if they are unmarked. Yes, overlooking the doors in this room is why people in the past were using debatable doors (such as the bricked up one) to try to reach 190. I didn’t realize until I read your comment that I had put a solve meter on this page. I agree with you that there is nothing really here to solve. I am deleting the erroneously placed solve meter. BTW – I enjoy creative use of punctuation and have my favorites for every mark (ie. the asterisk* in Kurt Vonnegut’s Galapagos). This is my favorite creative use of the period. The end. Re: Solve meters, do they only relate to the three stated puzzles in the book (riddle/path)? Or does it also gauge clues that can be gleaned pertaining to the non-stated puzzles? The solve meter reflects everything a room has to offer that can be solved with the exception of anything relating to the Riddle of the Guide. The five boxes are just way of gauging percentage. One room which is presently unsolved has only one riddle (that I know of) when solved the meter will go from zero to five. Other rooms have so many riddles that two have to be solved for the meter to go up one. Seems like if there’s a mystery here it’s how does The Guide leave the room?